"Regionalism is an utterly organic phenomenon. It is never possible to tell a place that it is a region or to make it be a region: either it is a region inherently, by its own internal logic, or it is not a region at all." "Learning to Think Like a Region"
A bioregion is a territory defined by its biological, social, and geographic coherence, rather than by political considerations. Since Ecotrust’s inception in 1991, our mission has included an effort to survey and define the underpinnings of this region that we call both "The Rain Forests of Home" and "Salmon Nation." That first year we began research on the distinctive ecological characteristics of coastal temperate rain forests. Part of the temperate rain forest biome, coastal temperate rain forests are distinguished by their proximity to oceans, the presence of coastal mountains and the high rainfall that results from the interaction between the two. One outcome of this inquiry was the publication of the first maps of the original distribution of coastal temperate rain forests in North America and throughout the world. 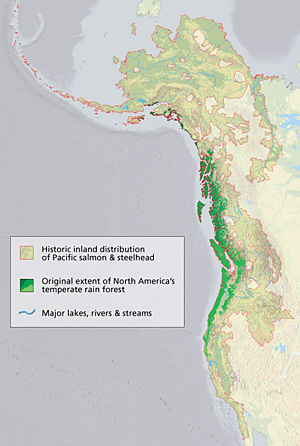 These maps demonstrated the significance of the coastal temperate rain forest on this continent — stretching from Alaska to Northern California, it remains the largest concentration of this forest-type in the world. In 1998 we began to view the uniqueness of this region through another lens. Stepping beyond the administrative goals of any governmental agency, Ecotrust performed the first synthesis and mapping of data for the entire North American range of the six Pacific salmon and steelhead stocks. A daunting task of data compilation, this effort drew upon the work of dozens of fisheries biologists along the coast. The resulting maps define the lands and waters of our Salmon Nation. Ecotrust's maps illustrate the ties that define the west coast of North America as a bioregion. The social and economic fabric of this territory has for millennia been determined by its forests and salmon, which also formed the twin pillars of the region’s hundred-year industrial economy. These maps, revealing the current state of trees and fish, remind us how much of that two-fold bounty has now been lost. In the northern latitudes much remains, while to the south, our restoration work has just begun. Learn more about The Rain Forests of Home and Salmon Nation. Some of the many groups we've worked with on projects large and small in the last two decades.